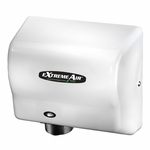 The AirbladeTM hand dryer wipes hands dry with a high-velocity sheet of air in just 12 seconds. It cleans the air before using it to dry hands, too. 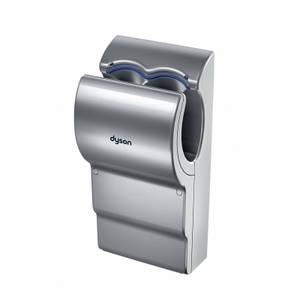 And it uses much less energy than warm air hand dryers so your business can reduce costs. It’s the first and only hand dryer that works properly. No heating element Water is wiped from hands using a sheet of air travelling at 400mph. There’s no energy-hungry heating element to power. Shorter drying times Hands are dry in just 12 seconds. Less energy is required for each pair of hands dried compared to warm air hand dryers. The AirbladeTM hand dryer is hygienic, too. Helping to keep clean hands, clean. Anti-microbial coating Anti-microbial additives are integrated into surfaces. Touch-free operation The AirbladeTM hand dryer starts and stops automatically. No dirty buttons to press. No rubbing Warm air hand dryers rely on people rubbing their hands. That just brings bacteria in the lower skin layers to the surface. With the AirbladeTM hand dryer, no rubbing is required. Clean, dry hands Because it’s so fast, people leave with dry hands not damp ones that can spread up to 1000 times more bacteria. Only clean air A HEPA filter removes 99.9% of bacteria from the air used to dry hands. •Touch-free operation: Infra-red sensor control for touch-free drying and minimal energy wastage. •Anti-microbial additives: Anti-microbial additives are integrated into surfaces. •Easy to clean: Tough, sealed ergonomic design for easy cleaning and maintenance. •Robust aluminum die-cast casing: Durable casing resists chips and scratches. •HEPA filtration: HEPA filter removes over 99.9% of bacteria from the air used to dry hands. Over 930 sq in. of High Efficiency Particle Arrestor (HEPA) filter integrated with anti-microbial additives. •Efficient standby mode: Standby power consumption of 1 watt for increased energy efficiency. •Rapid, hygienic drying: Wipes hands dry with a high velocity sheet of air in 12 seconds. Thermoset plastic with a 0.3mm gap along its entire 9 inch length directs air at 400mph to dry hands. •Dyson Digital Motor (DDM): The DDM is a long life, new type of electric motor. As a result, it’s incredibly powerful (81,000 rpm) for its size generating the high air velocity needed to dry hands properly. •Noise suppression: Precisely tuned silencing technology integrated into the motor housing and ducting to reduce air noise. •High compression fan: Digitally switched at up to 6,000 times per second making the compressor spin at 81,000rpm.